We have offered conventional dental implants to replace missing teeth since 1998, but a new exciting technology emerged in 2006. Since 2006, we have introduced NOBELGUIDE cadcam guided implant treatments at the centre. With this state of the art technology, we are able to offer you "teeth in a day". Extensive and thorough pre-treatment planning allows for predictable transfer of extraoral planning into the mouth with pinpoint accuracy. 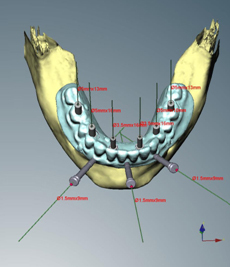 The dental implant rehabilitation is pre-planned on cadcam software and a specially guided surgical stent is prepared from the diagnostic setup to guide placements exactly where implants are planned. 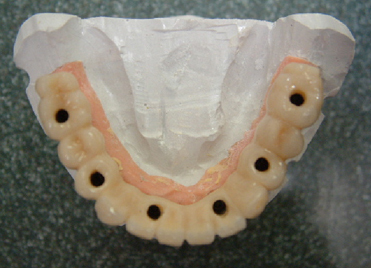 This gives us the ability to complete the final prosthesis (bridge or crowns) before the implants are placed in order to provide "teeth in an hour". Please call our reception staff to make an appointment to discuss this amazing technology.